Concrete can be damaged by a number of factors. Underground erosion, shifting soil, and natural disaster events like earthquakes or floods can all create the right conditions for concrete to sink. Because of its rigidity, when concrete sinks in one place, it rises in another, creating uneven pressures across its surface that can lead to uneven ground or cracked and buckling concrete. This process can be gradual and take place over months or years, or it can occur suddenly during natural disaster events. No matter the cause behind your damaged concrete, it’s important to take care of it promptly to prevent injury or further decay. In today’s post, our concrete experts at B & B Concrete Lifting will address why concrete lifting is often the superior choice to concrete repair. When you have cracked or uneven concrete on your property, you have two choices: repair or replace. Either of these options is better than outright ignoring the problem. Damaged concrete is not just unsightly — it also poses a safety risk. 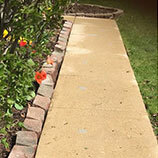 If the sidewalk outside your home is cracked or slanted, any person walking on it is at risk for tripping and falling. First of all, you obviously wouldn’t want anyone to be injured on your property by a preventable hazard. Second of all, you wouldn’t want to be held liable for that injury! Protect yourself against this possibility by ensuring your concrete is in good shape. First of all, concrete lifting is much less expensive. To replace a concrete slab, you have to hire a demolition crew to break apart, remove, and discard the old slab, stabilize the foundation beneath, and repour the new cement. This is a timely, costly procedure that requires a lot of manpower, hours, and materials, and you’re responsible for the bill. In contrast, concrete lifting requires much less time and manpower. All told, concrete repair costs about half of what concrete replacement does. That’s 50% savings for a very similar end result! 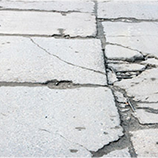 Your wallet will thank you when you choose concrete repair. 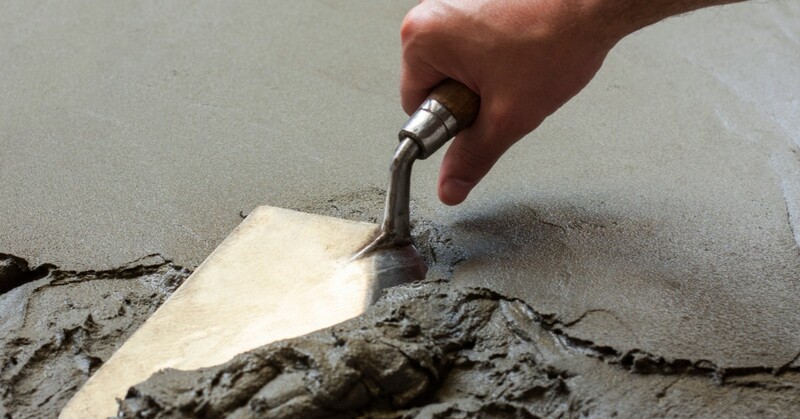 Replacing a concrete slab is a multi-step process that can take several days or even weeks. Concrete lifting, on the other hand, can be completed in just a few hours. Almost all of B & B Concrete Lifting’s jobs take less than a day, start to finish. There is also significantly less downtime required after completion — concrete can be walked on almost immediately after a concrete lift, whereas it requires a long time to set after complete replacement. Cut down on the downtime and choose concrete lifting today! A concrete replacement is an invasive process that can stretch on for many days, disrupting your life with construction noise and traffic. It requires demolition and can cause damage to the surrounding landscaping. Concrete resurfacing or concrete crack repair, by contrast, does not require demolition or concrete pouring crews. It takes far less time, far fewer men, and less (and quieter) equipment. Overall, concrete lifting will cause much less of a disruption for your life than replacement will. When Is Concrete Replacement The Better Choice? If concrete lifting is so much better, then why do people ever elect for concrete replacement? In some cases, replacement may be the better or necessary choice. Although most concrete can be lifted, if large areas of concrete have deteriorated or crumbled, repair alone will not salvage it. If you’re unsure as to whether your concrete needs a full replacement or simply repairs, then feel free to call us today. We can help you identify the best choice for you and your property. 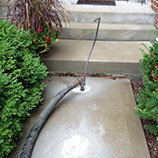 If your concrete needs some sprucing up, then there’s no one better for the job than B & B Concrete Lifting. We have the skills and experience to tackle any concrete problem. 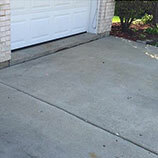 From concrete driveway repair to sidewalk repair and more, we’ll give your property the makeover it needs. With the highest quality work in the field and a two-year satisfaction guarantee, you can be confident that B & B Concrete Lifting is the perfect choice for the job. If you’re seeking concrete lifting or repair in the St. Charles/Fox Valley area, then please contact us today to schedule your free consultation!